My First Carolina Cup Experience. 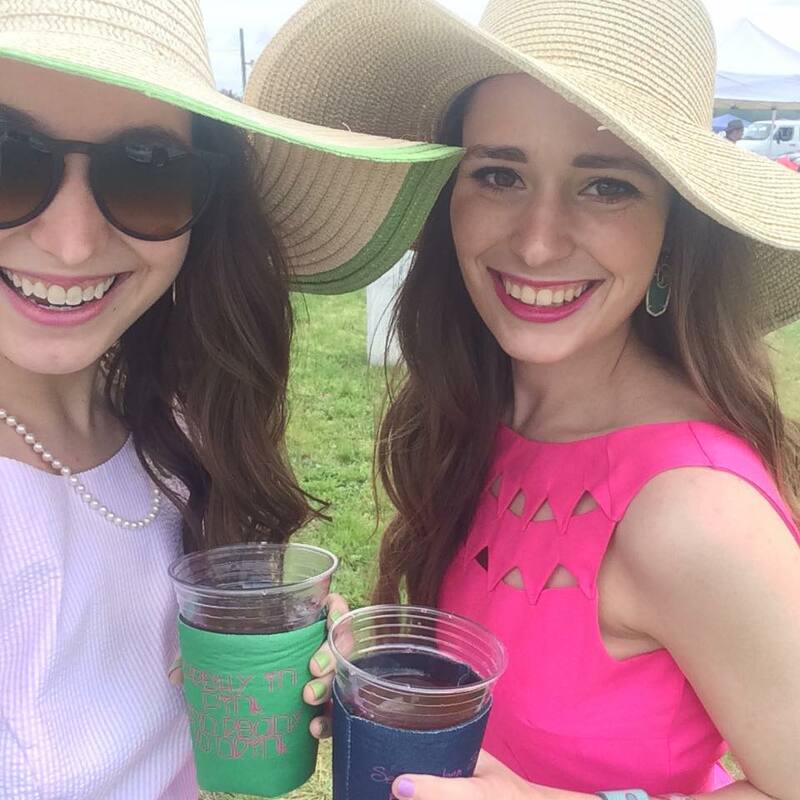 It has been on my bucket list for a few years now to attend one of the biggest annual Southern traditions: the Carolina Cup! 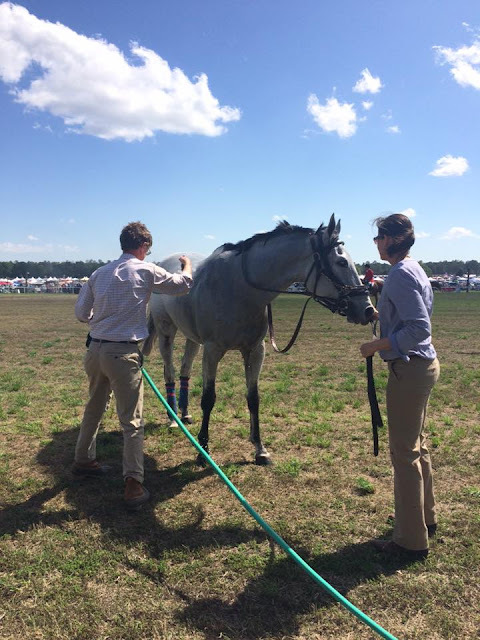 I finally got to check this item off of my bucket list last weekend, when I attended the 81st annual Carolina Cup steeplechase race. 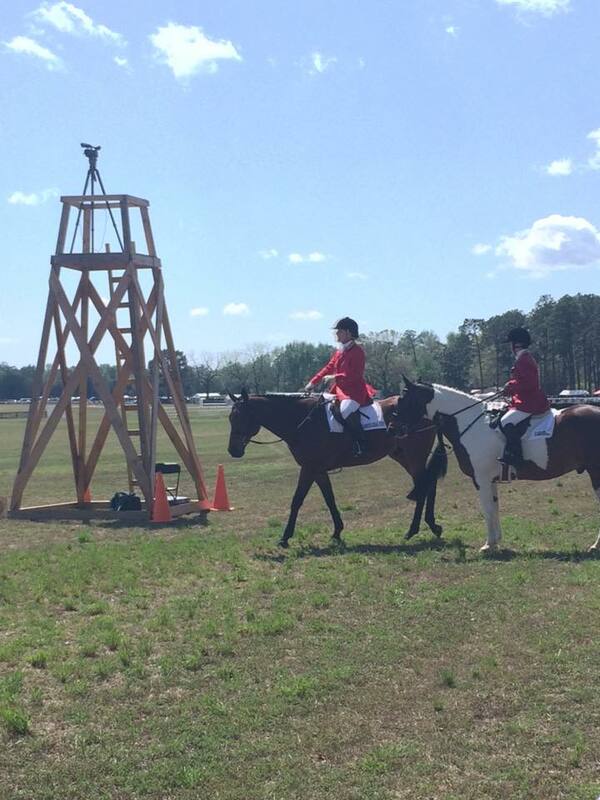 The Cup is held annually in Camden, SC, and is probably the most famous horse racing event held in the Carolinas! My first experience with horse racing was last May, when I had the opportunity to visit Churchill Downs in Kentucky twice during an internship that I had in Louisville. Visiting Churchill Downs was all I needed to fall in love with racing- it is such a fun and fast-paced sport, and I love the culture of a day at the races. Derby inspired fashion is possibly my favorite part of all! Ladylike dresses and large hats are usually incorporated into my spring and summer wardrobe to begin with, so having any event to attend that's an excuse to wear them is always wonderful! 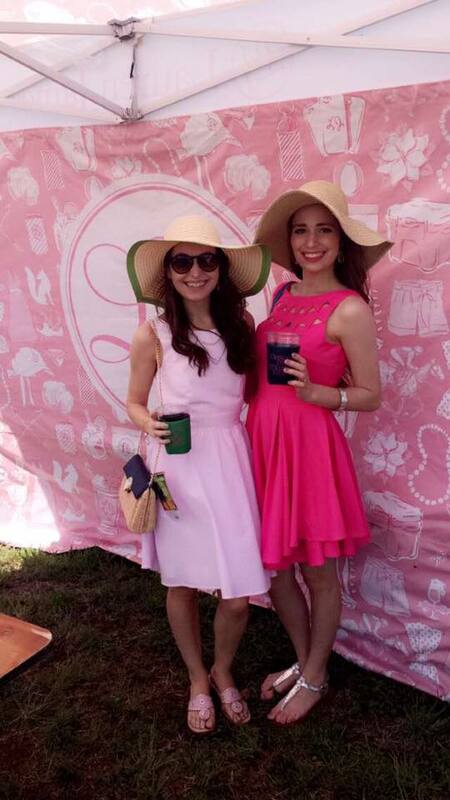 I went to the Carolina Cup with one of my blogging besties, Cara from Caralina Style. Cara came down the Charlotte and ended up spending the whole weekend with me, which was so much fun! The Springdale Race Course in Camden, SC, is about an hour and forty-five minutes south of Charlotte, so we woke up early Saturday morning to get ready. We made a quick stop at Chick-Fil-A for breakfast, and then we were off! Since this was my first Carolina Cup experience (and hopefully not my last! ), and this event is such a Southern tradition for many Carolinians, I thought that it would be fun to recap how Cara and I spent our day at the Cup, our thoughts for if we return in the future, and what we recommend bringing! How fun is this Snapchat filter that was sponsored by Bumble?! The gates to the Carolina Cup open promptly at 9 am each year, and the first race of the day begins at 1:30 pm. Cara and I decided to try and arrive between 11-11:30, and this was a perfect arrival time since we didn't have specific tailgating arrangements made. Springdale Race Course has two different tailgating sections, both of which are open to all ticket holders of the Cup to walk through. One is a general tailgating section right in the middle of the field, where groups of families and friends set up tents, trucks, and other tailgating necessities, and then stake their spot for the whole day. The other tailgating section is College Park, which is reserved for Greek organizations (mainly fraternities) from various large universities across the South. Cara and I took a couple of walks around College Park, and it was quite the experience! The various fraternities all turn their tents into total party zones, and it was fun to see the different environments from tent to tent (some were blasting rap music and had people dancing on trucks, and others decorated their areas with hay bales and played the latest country hits). 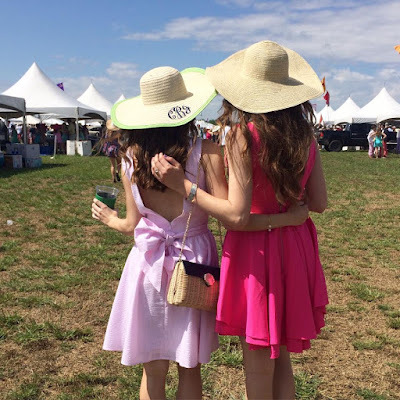 Even though my college does have Greek life, we mainly have sororities, and the small fraternity culture at my school does not really have the same feel to it as what I got to see at the Carolina Cup. It was definitely fun to get to see what Greek life is like at big schools for an afternoon! 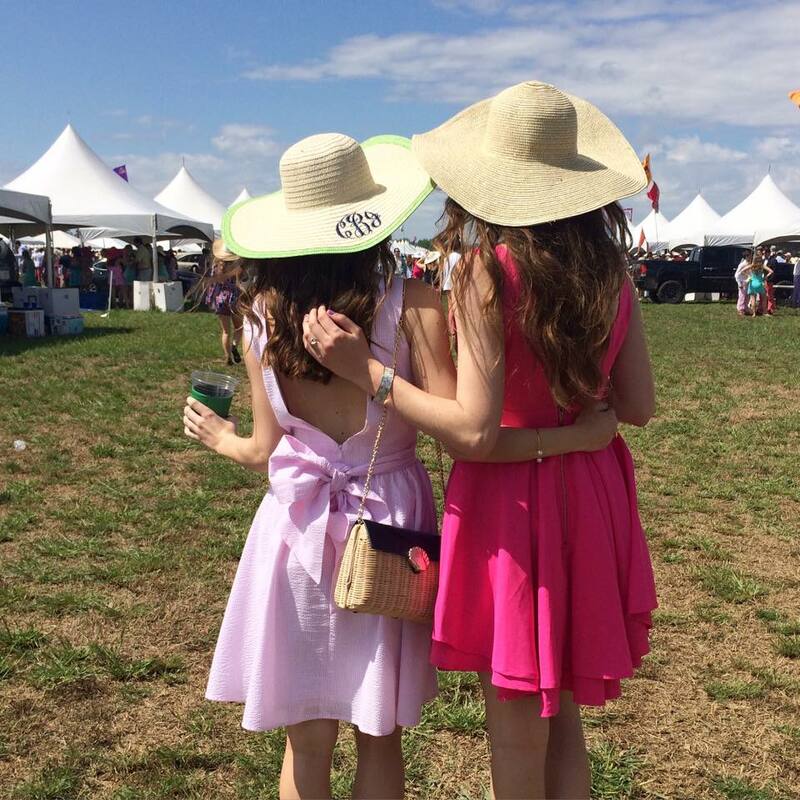 The Carolina Cup is an open container event for those aged 21+. Even though Cara and I didn't have specific tailgating arrangements made, we were able to enjoy adult beverages over all sections of the race course. Something that we didn't know before attending is that glass container beverages are prohibited. We had to leave our glass items in my car, and walked back out to the parking lot a couple of times throughout the day for refills. 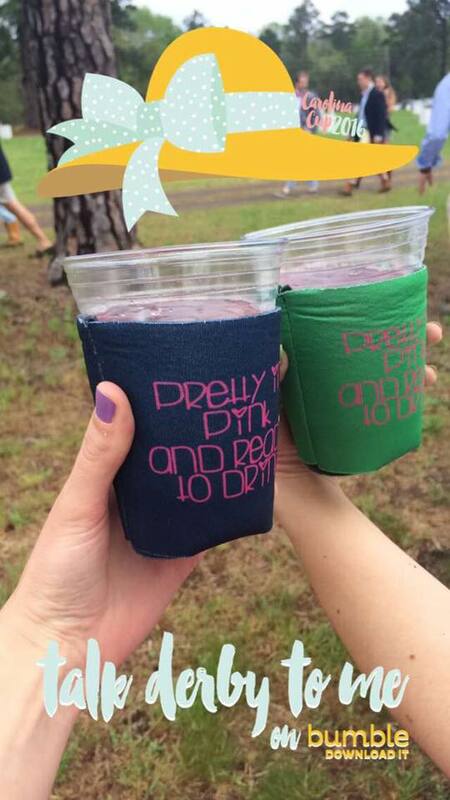 So we ended up just using plastic cups and some adorable matching koozies. (And how cute is that fun Derby themed Snapchat filter pictured above?!) I didn't drink very much as I was driving that day, but it was still really fun to get to enjoy an open container event! I definitely think that it was more fun to attend the Cup as a 21+ year old. There are six races throughout the afternoon, and we left either right before the fifth race, or during it. The town of Camden is small, and we didn't want to get caught in tons of traffic as thousands of people tried to exit the race course at once! I think that this was a very smart decision. If you are tailgating, it would be hard to leave early. But for general admission ticket holders, definitely take advantage of sneaking out early if you can! Cara and I had a lovely day at the Carolina Cup, and both of us would like to return either next year or in another future year! I do think though that probably the funnest way to do the Cup would be to attend with a larger group and have the reserved tailgating experience. Cara and I talked about how much fun it would be to get a big group of NC and SC bloggers together for next year, and to all go down early in the morning and spend the whole day tailgating together! Have any of you ever been to the Carolina Cup before? Or any other popular horse racing events? It's still my dream to attend the Kentucky Derby someday, since my first Churchchill Downs experience was so incredible! I definitely want to go to the Carolina Cup at some point. Part of me wishes I had gone in college, but that's a different experience than what I would want. A lot of college students never see a horse when they go. Love your outfits, so cute! I absolutely love your outfit! It looks like you had soooo much fun! Carolina Cup's are some of my best memories from college! You feel the southern traditions and fun atmosphere in the air all day! Haha .. glad to hear you had so much fun! There definitely isn't anything like the Carolina cup near Seattle, this event looks like soo much fun! your outfits are so cute too! This sounds so fun! I have always wanted to attend the Carolina Cup at least once in my life just because I'm so close! Glad to hear you had fun and loved both of your dresses!! I've been living in SC for a few years now and this is on my list too! One of these days I will make it up there! Going to a derby looks like it's so much fun! I love the dress you wore! Wow that's so awesome! I love the fashion of horse races too, it's so elegant and classic. It's been my dream to go to the Kentucky Derby since I was a kid because I just adored horses. Hopefully one day! This looks like so much fun! I've always wanted to go to the derby. So glad you enjoyed the Carolina Cup! I want to go someday and also to the Kentucky Derby. Love the hats! I would love to do something like this! You two are just adorable! Looks like y'all had an amazing time! Cant wait to go to the Cup in college! Sounds like you had a blast, and you and Cara both look adorable! your dresses are adorable! love! I wish I wasn't allergic to horses, I would love to go to the cup (or any other horse race). I'm happy you had fun. Life Updates: My Post-Graduate Plans!